I’ve been working on a new Artful Memory series for my friend, Wendy. Her mom died a couple of years ago and this past fall, she was ready to have some memories made. The first piece I did was for her dad as a Christmas gift. W endy shared that her mom liked to play Bingo and the slots. She was a good cook and loved her family. The piece that evolved is a Bingo card made of favorite recipes and fabric from a blouse. Photos of her parents were used as the Bingo markers. I included important dates and squares that looked like a winning slot machine! Wendy’s dad was quite touched by this wonderful gift from his daughter. My granddaughters took a class at Maine Quilts this past weekend. They made a travel tic-tac-toe game. 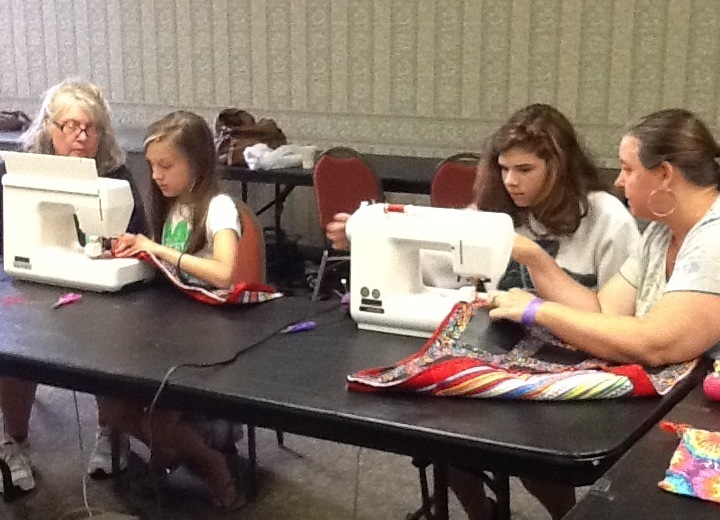 Here they are concentrating on their sewing. Lydia on the left is 10 and Yolanda on the right is 13. They had a great time. 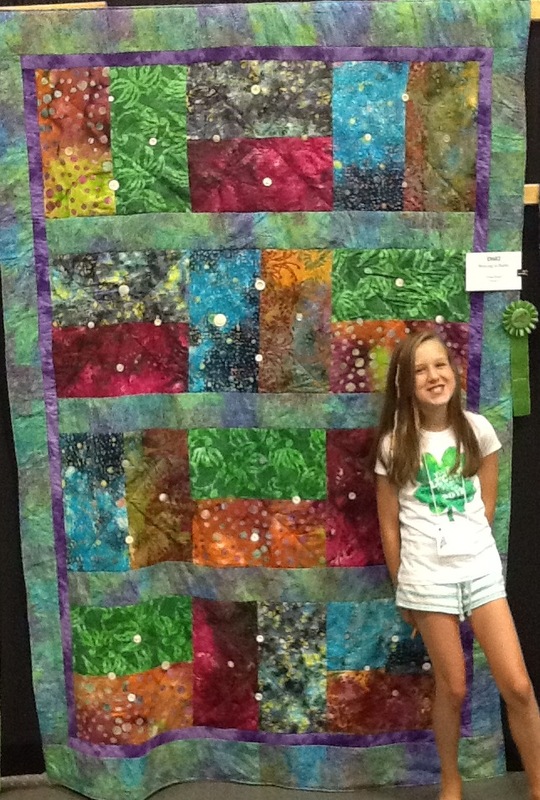 Lydia also had her quilt hanging in the show. This is her second quilt to be shown at Maine Quilts. This one is called Weaving with Batiks and fits on her full-size bed. She did a fabulous job piecing it, quilting and sewing the buttons. Just look at the grin on her face – she’s very proud of her work, as she should be! Our word for June was WOW! I had a difficult time with this word, because I was feeling like I wasn’t getting anywhere with whatever I was working on. So I decided to keep track of the work I actually did. That was an eye-opener and a WOW for me. I accomplished a lot in the four weeks between our meetings. 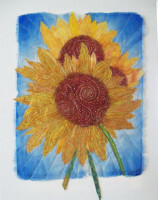 I completed the piece at the left, Soltice Sunflower. Also completed the labyrinth piece shown last month. 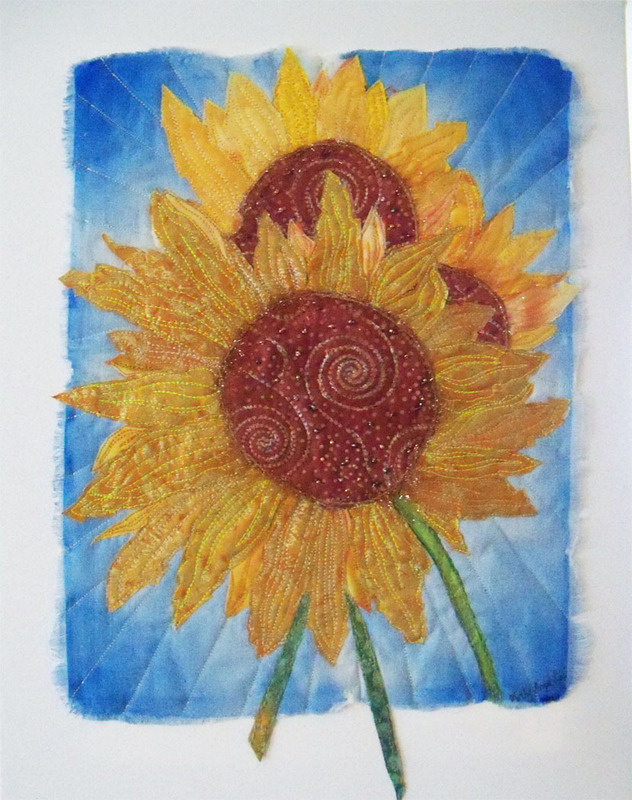 I made about 20 fabric collaged cards and 20 paper Iris cards. I also completed 35 fabric key rings using yo-yos made from my scraps. I stained and/or painted the small shadow boxes and filled ten of them ready for showing. So all in all, I decided that I did have a WOW month and completed much more than I had originally thought. After I posted about my show on the Fourth of July and the success with the shadow boxes, someone asked me to post a picture of the boxes. They are 5×7 wood boxes that hold either a matted piece or a piece mounted on foamcore. I also have 8×10 boxes. They are either stained brown or painted black. There is no glass so you can easily see the texture of each art piece. In my booth they are displayed as Hidden Treasures of Maine with each box showing off a small part of Maine. They were quite popular at my first show of the season and they’ve also been selling well at a gallery in Kennebunkport. 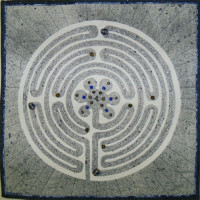 Several years ago my minister introduced me to labyrinths and how they are a means to meditate. Since that time, I’ve seen many different kinds of labyrinths. The word for this challenge was labyrinth and I immediately thought of this stenciled piece that a friend had given me. 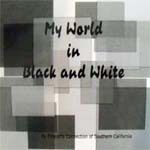 Background is splattered with gray and black paint. 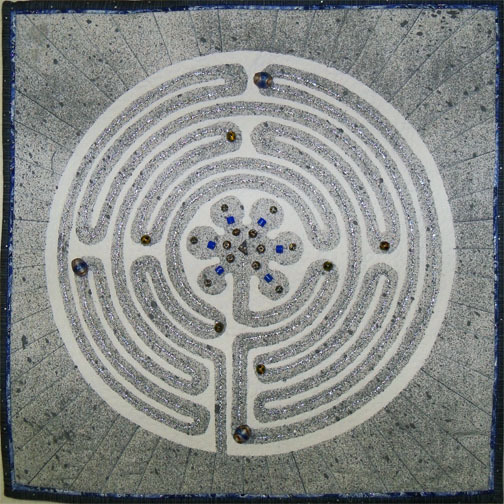 I stitched radiating lines round the labyrinth and then used a silver cording for walking the path. Beads along the way allow you to stop and meditate. There’s a hint of blue in the beads and that blue is picked up in the narrow piping at the binding edge. 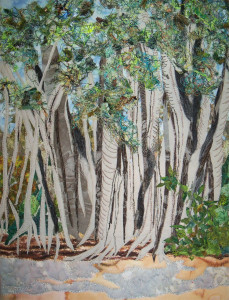 This piece started as a painting on fabric. The background was ok, but the sunflowers just didn’t look right. So I started cutting out petals from fabric and adding them to the flowers. Then I found this great fabric for the middle – it was something I’d bought in Budapest and it was perfect! Beading in the centers added another layer. The actual fabric piece is 14×11 and it’s mounted on an 18×14 canvas. I knew immediately what I was going to do when I got the word, shadow. 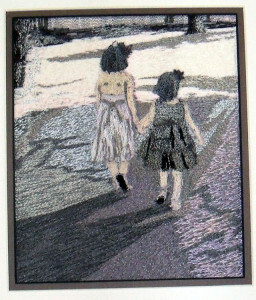 I have a small 6×6 picture of my granddaughters walking hand-in-hand. I scanned the picture, then, using Photoshop, I made it a black and white picture and printed it on fabric. 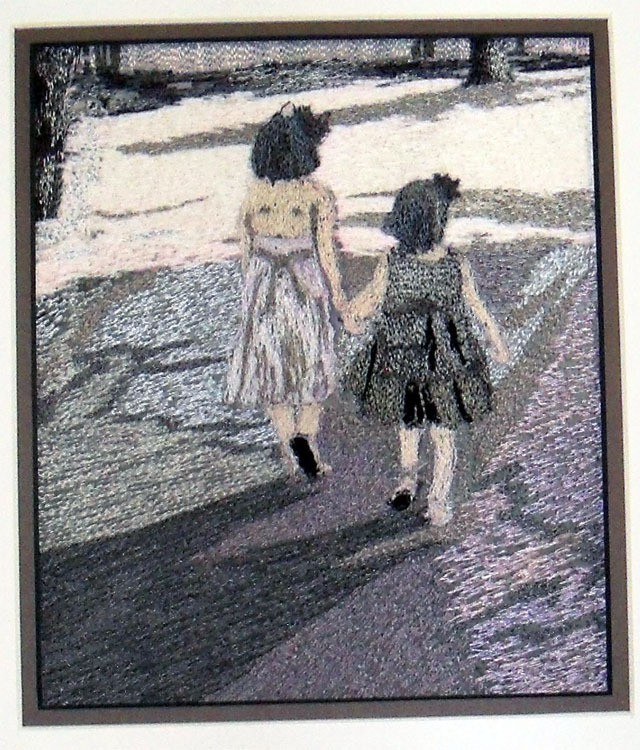 The entire piece is done with stitching with black, white, off-white and gray thread. Not only does it have shadows in the picture, but it’s a play on the younger sister as the shadow of the older sister. It is one of my personal favorites. Actual piece is 6×7-12 mounted off-center in a 20×14 mat. Next word in our series was entwined. When the word was announced, I knew immediately what I was going to do. Several years ago, I took pictures of banyan trees in Florida. I loved the way they twined around each other and how the roots hung from the trees down to the ground. I used paint, yarn, painted fabric, and lots of stitching to get the effects I wanted. I really like this piece – it’s one of my favorites so far. 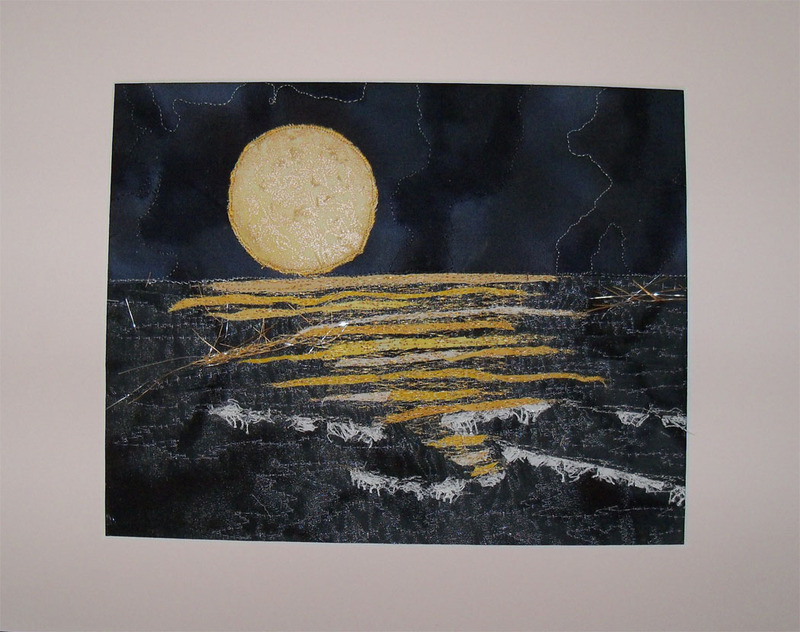 The fabric piece is wrapped around a 16×12 canvas and is ready to hang. Our word for January was community. I wanted to try some weaving so decided to use fabric and paper in related skin tones. 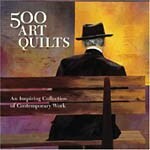 I actually was thinking of another quilt I’d done, Step Into the Colors of the World , where I’d used skin tone fabrics. 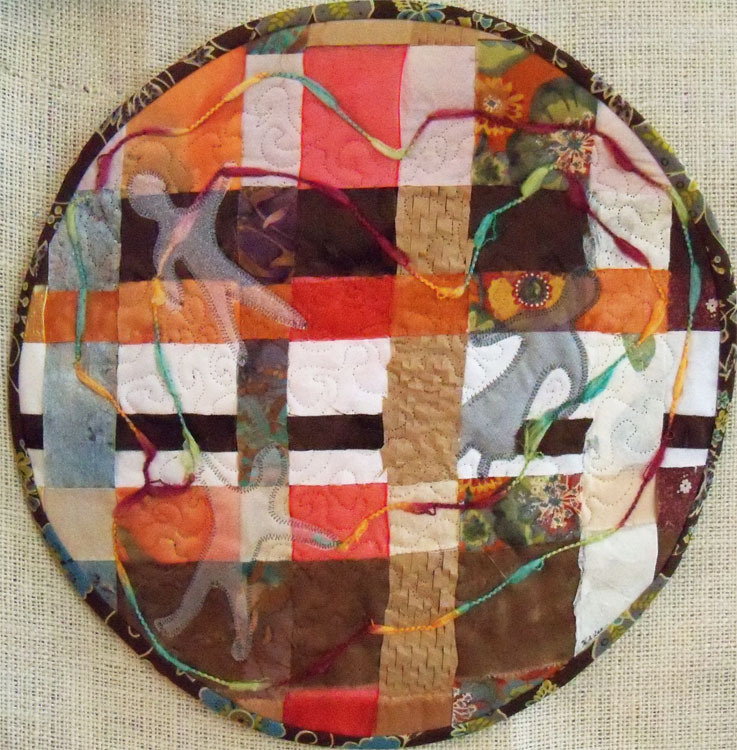 Once the fabric was woven, I decided to make a circle with organza people images. Working title for this piece is Different, but Connected. 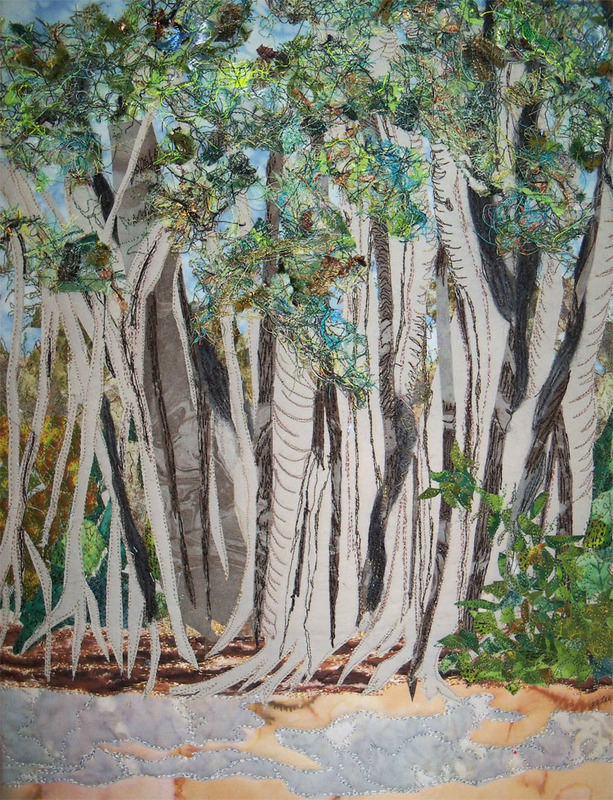 The people are connected by variegated yarn and stitched onto the woven background. 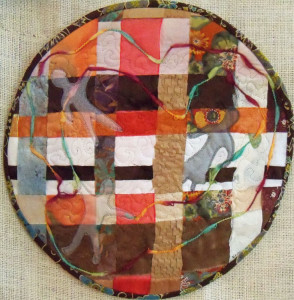 Piece measures a 12″ circle. Third word in our Fearless series was luminosity or luminescence. I tried to depict the luminescence of the full moon on the ocean at night. I wanted to do this using fabric that was not shiny and a little bit of metallic thread. When you walk on the beach at night, it really does feel like you could walk on the luminous path right to the moon.